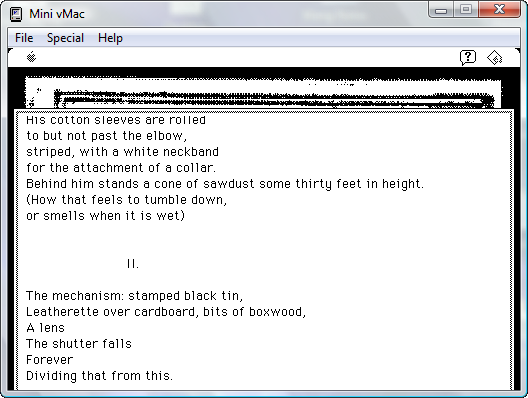 William Gibson’s poem played from a 3½-inch diskette on a 1992-era Mac computer running the System 7 operating system. 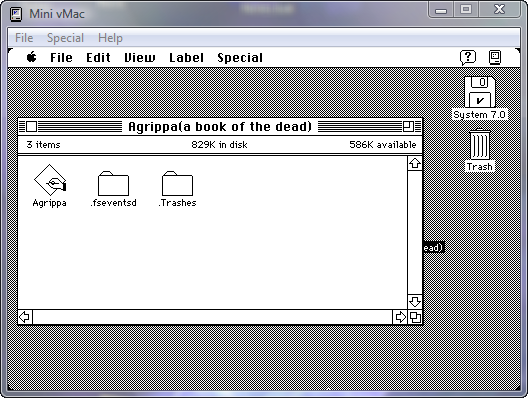 When the diskette ran, the text of the poem scrolled up the screen (accompanied by infrequent sound effects: a camera shutter click, a gun going off) while an encryption program on the diskette encoded each line and made the poem “disappear” after its first reading. Item #D51. 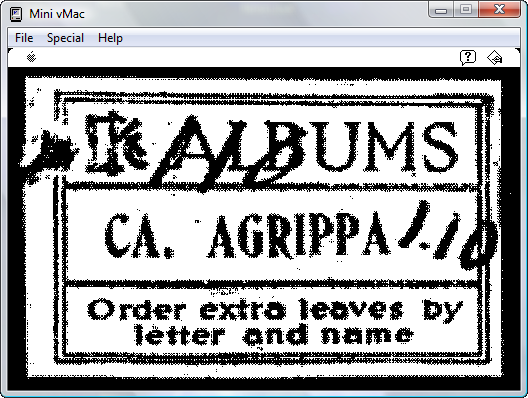 Video capture of a “run” of William Gibson’s “Agrippa” poem made from playing a disk-image (bit-level) copy of original 1992 Agrippa diskette. 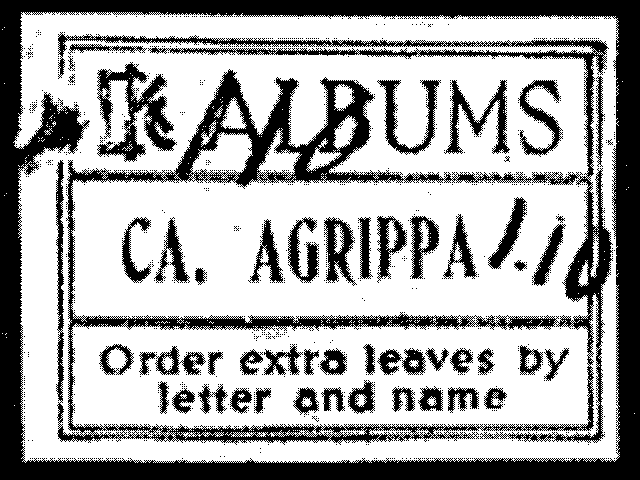 Source: original 1992 Agrippa 3.5″ diskette, 1.4 Mb, loaned by collector Allan Chasanoff. 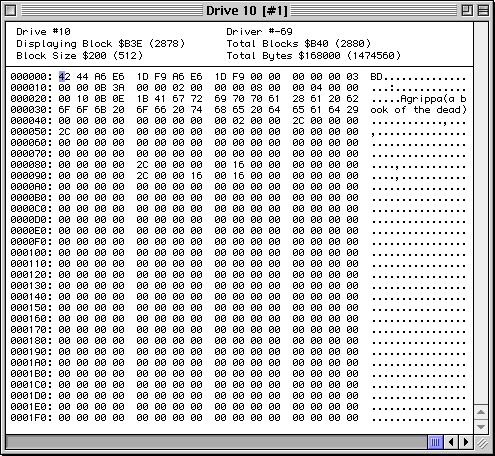 Process: » Disk image (bit-level copy) made using the “dd” copy process. 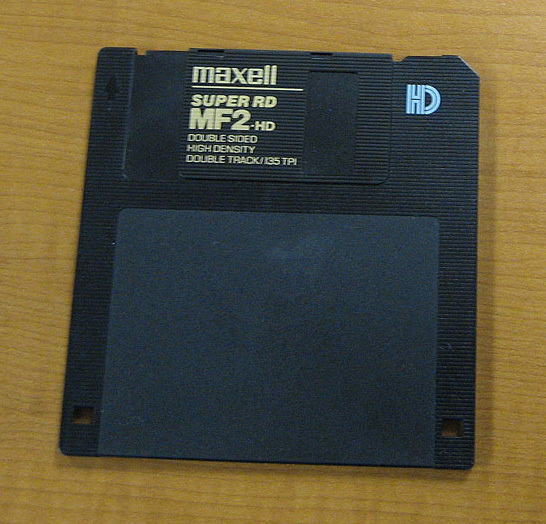 (See Item #D50 on this site: downloadable disk-image file.) 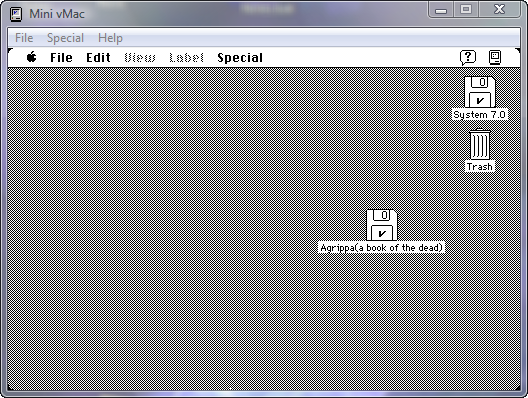 » Run of the disk-image copy on a computer using Mini vMac emulator with System 7 book disk (to emulate the functions of the original 1992 Mac platform for which the software on the diskette was created). 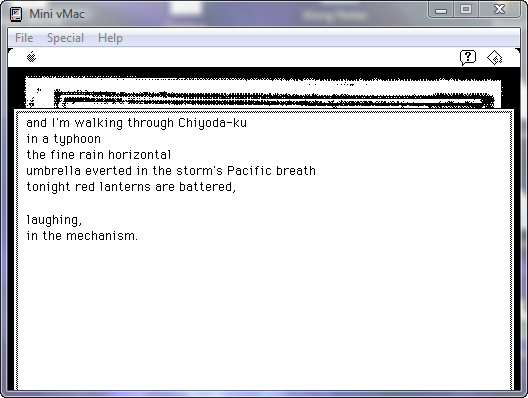 » Video capture of the resulting run of the poem. Bini Tecle and Allan Rough, University of Maryland, College Park. 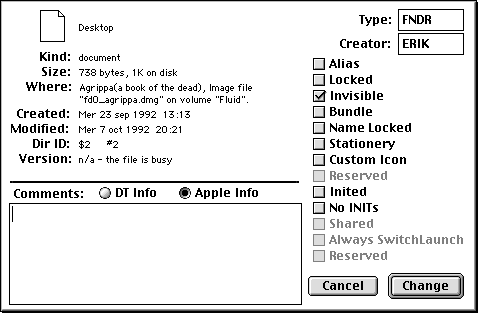 Permissions to copy, run, and reproduce the diskette online received from: Kevin Begos, Jr., Allan Chasanoff, and William Gibson. 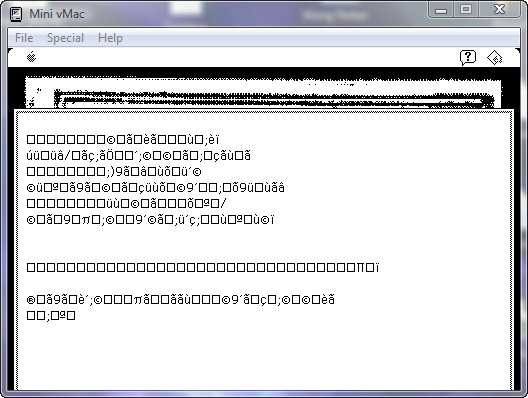 Item #D50. 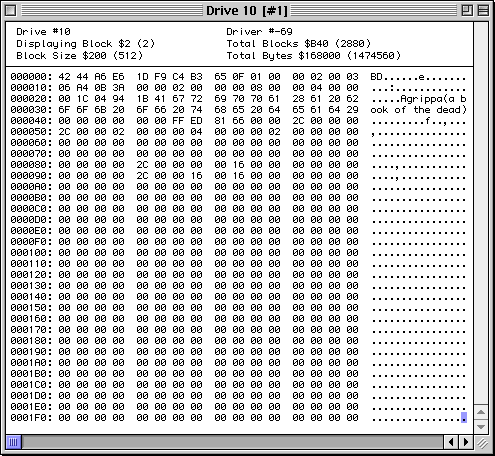 Disk image (bit-level copy) created from collector Allan Chasanoff’s original 1992 Agrippa diskette. 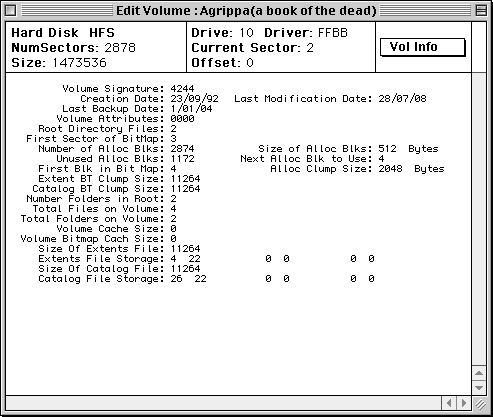 See also an independent technical analysis of the disk image performed by François Grieu, an engineer based in Paris (who also provided the screenshots, audio files, and other resources from his analysis at the left). Item #D52. 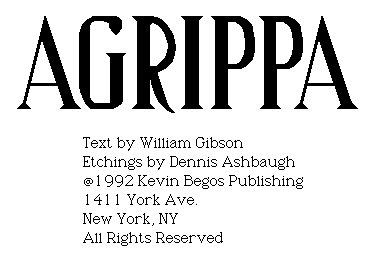 Original 1992 Agrippa 3½”, 1.4 Mb diskette belonging to collector Allan Chasanoff used to make the disk-image copy and emulated run of the William Gibson poem featured on this site. 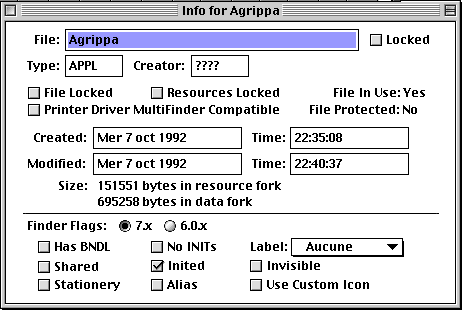 This was the diskette used to create The Agrippa File’s disk-image (bit-level) copy of William Gibson’s poem and its accompanying software, as well as the emulated run of the whole package. 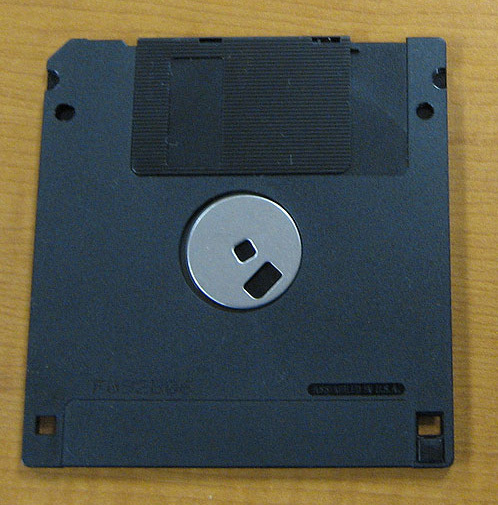 In the Digital Forensics Lab at the University of Maryland, College Park, multiple copies were spawned from the original diskette and run through a computer emulating the platform of a 1992-vintage Mac. 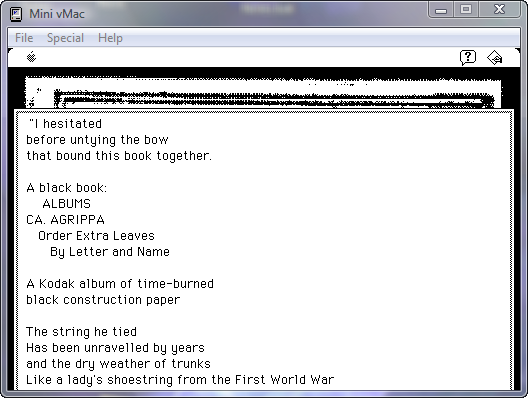 Multiple instances of Gibson’s poem thus came back to life, ran, and died (disappeared at the hands of the disk’s included encryption program) in the effort to capture the experience of reading the original poem—the experience, that is, minus the sense of one-time-only uniqueness that was part of the core work. 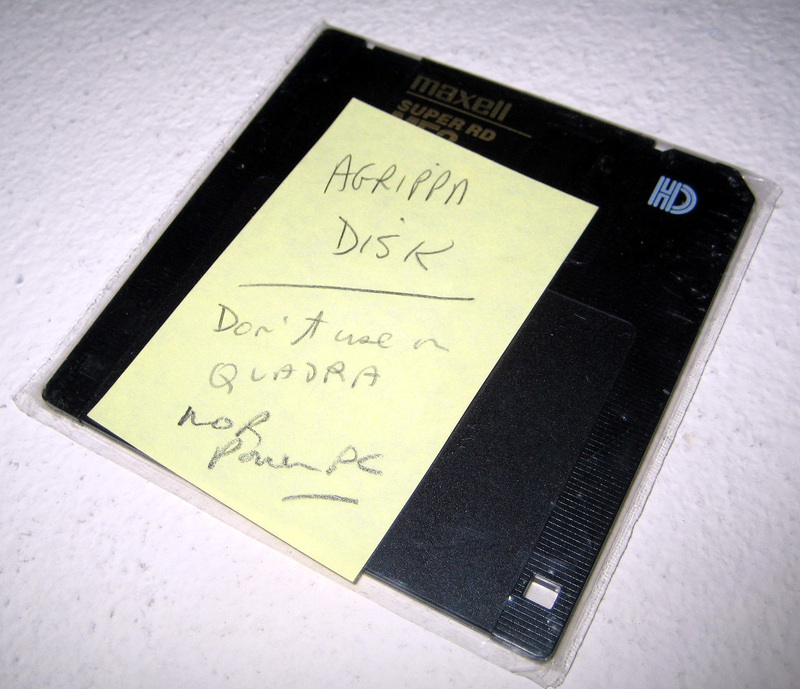 The diskette was loaned by Allan Chasanoff from his copy of Agrippa (editioned “10/95”). Chasanoff’s copy of the book is part of a collection of “book art” he began aggregating in 1990 that has grown to 275 works. The theme of his collection is “the artist and the new ‘disrespect’ he had in opposition to the older cultural devotion to the integrity of the book” (email from Chasanoff to Alan Liu, 5 December 2008).